Saturday April 16th 1898 I was busy with the work most of the forenoon. We had early dinner and went up town in the surry. Was over home and found Mother much better. came home in time to do evening work. I practiced in the evening. very warm day. Sunday April 17th 1898 I was busy about the work all forenoon. Levi went home. I soon got some dinner for Will and I and we went down to Johns to see the folks from up home. After they went home we came on to do the evening work. I wrote in evening. Monday April 18th 1898 It was a rainy day. I did the work, put in some time at the piano and did sewing. The boys worked about the farm. 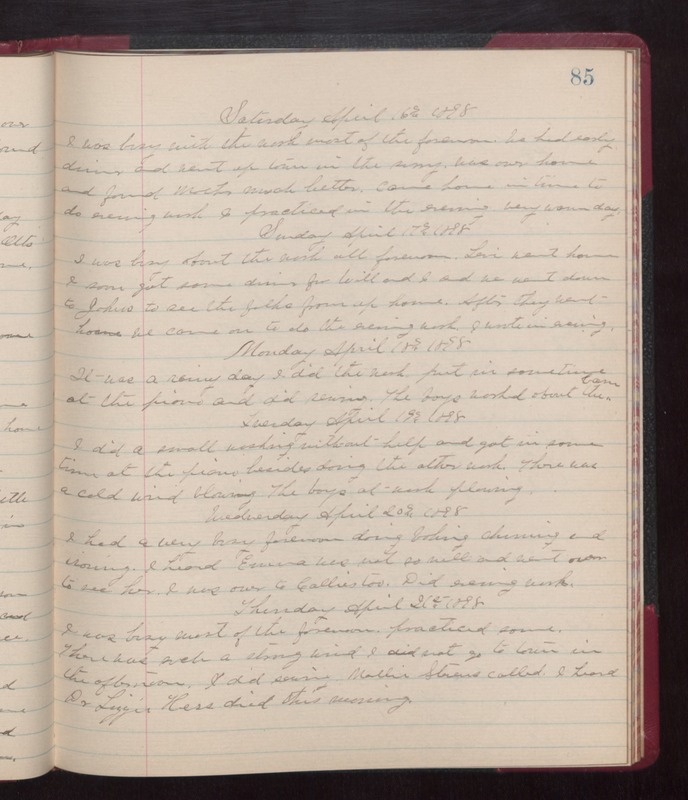 Tuesday April 19th 1898 I did a small washing without help and got in some time at the piano besides doing the other work. There was a cold wind blowing. The boys at work plowing. Wednesday April 20th 1898 I had a very busy forenoon doing baking churning and ironing. I heard Emma was not so well and went over to see her. I was over to Callies too. Did evening work Thursday April 21st 1898 I was busy most of the forenoon, practice some. There was such a strong wind, I did not go to town in the afternoon. I did sewing. Mollie Stevens called I heard Dr Lizzie Hess died this morning.